Matuidi played in a hybrid left 8/left wide midfielder role mostly supporting the midfield line in the left half space both in and out of possession. With Kante holding position in the centre, this gave Pogba, France’s most offensive and creative midfielder, the licence to support attacks in slightly more advanced positions on the right side. From his right flank berth, Mbappe had a roaming wide forward role, including diagonal runs across the width of Argentina’s defence, moving infield to the half space and receiving the ball wide before dribbling diagonally at the heart at the opposing defence. The remaining forwards, Giroud and Griezmann shared the roles of central forward and left half space forward. The combination of these factors gave Deschamps’ side a strongly right side-focused attack. With most attacks coming through their right flank, Pavard was often found in more advanced positions than Hernandez. Meanwhile, due to their talismanic figure Lionel Messi, and his preference for the right half space, Argentina also had a slightly right side biased attack. Both sides’ preference for attacking down their right gave a natural diagonal flow to the game. 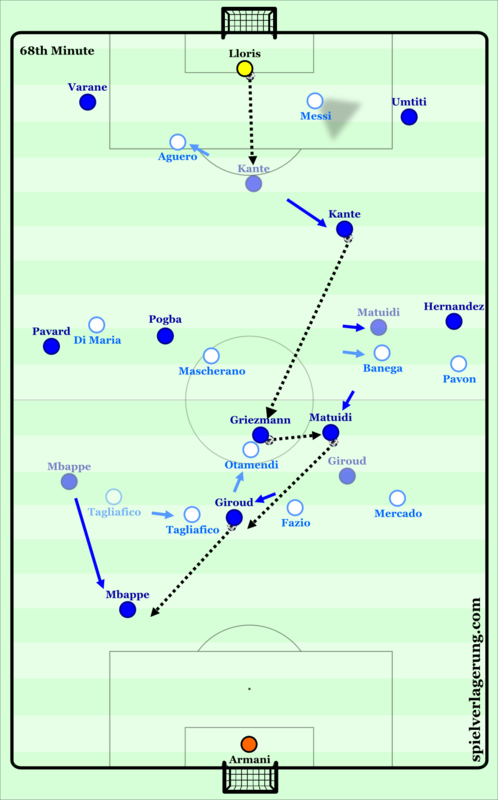 In the aftermath of France’s right side attacks with their structure slanted towards this side, Argentina were naturally encouraged towards their right upon regaining possession. However, the deeper positions of Matuidi and Hernandez meant France were well equipped to deal with quick counters, which led Argentina to settle for more positional attacks. By contrast, Argentina’s right sided attacks often meant their left was slightly understaffed leading France to counter through these spaces, with the speed of Mbappe. Despite controlling possession for much of the first half, Sampaoli’s side were largely unable to create chances, with their sole shot on target coming from Di Maria’s long range effort. Their consistent inability to enter the final 3rdwith time-space advantages or in dangerous positions stemmed from their inability to play through spaces inside France’s defensive shape. From the start of the game, Argentina seemed intent on creating the most deep, flat and wide structures possible from their nominal 4-3-3 base. Pavon and Di Maria stayed high and wide, on the outside shoulders of the France full-backs, Mercado and Tagliafico remained deep and wide giving an easy first pass for the centre-backs. Strangely, Banega and Enzo also moved out to their respective wings when the full-back on their side had possession. In addition to the wide full-backs and wingers, this meant Argentina constantly had a 3-pronged line on the flanks and no presence in the near half space. As a result, Messi was consistently alone in the space between France’s midfield and defence. Without any nearby options to combine with, Messi hardly even received the ball, as he would be quite easily controlled. Thus the South American outfit constantly played from flank to flank, switching through the defensive line before occasionally forcing simple attack down the line with hopeful chipped passes. Without the ability or even the threat to play in spaces within France’s structure, the Europeans could quickly shift and prevent progression on the wings. Quite simply, without a central presence, it’s tough to have good attacks down the wings or, obviously, through the centre. Keeping the full-backs deep could be explained as a cautious decision to give better stability against France’s counters, and the wide wingers as a natural follow-up decision to ensure offensive width, however the movement of the 8s to the wings was a redundant addition. The movements of Banega and Perez to the flanks often opened large gaps in the near half space, with Matuidi or Mbappe widening their position in response, as well as the full-back staying wide with the Argentina winger. Yet there was no reaction to use these opened spaces for attacks, no diagonal depth runs from the wingers, or movements inside to receive in these spaces. Instead they continued to force attacks down the wings to create crossing opportunities. This made little sense given the lack of support around Messi and and the lack of presence in the box as a result. Argentina’s deep and wide positional structure may have been part of a risk-averse plan to avoid turnovers, and have stability against France’s biggest offensive threat; counter attacks. However, particularly early in the half, they failed in this phase too. As a result of their deep and wide structure in possession, they lacked the necessary presence to create an intense counterpress. In these situations, the first France receiver had time and space to carry the ball forwards or look to play directly into depth for their forwards. 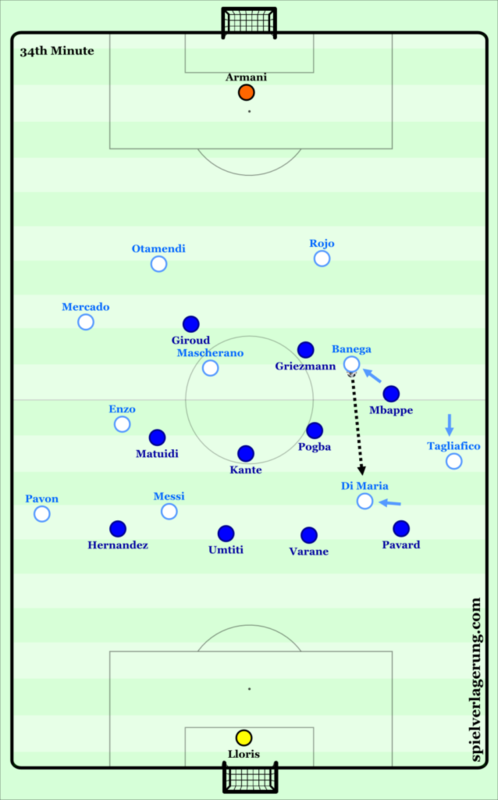 Additionally, when France decided against a direct attack in these situations, they were easily able to space out and set up a settled possession phase. Without this ability to force quick turnovers Sampaoli’s side were unable to dominate territory. Just after the half hour mark, a few adjustments to the players’ roles and resulting structure improved Argentina’s play in possession and allowed more constant attacks through an improved territorial advantage. Banega began dropping deeper, but more centrally when the ball was being switched from right to left, giving Otamendi a diagonal passing option. In response, Tagliafico began moving higher and wider, with Di Maria responding by moving into open room in the half space. Messi began dropping into deeper midfield spaces, with Enzo balancing his movements. This was seemingly an attempt to use Messi’s needle ability to force play through France’s pressure zones, in addition to Banega’s increasing presence in moves. With these movements they began playing within France’s block, experienced more space on the wings and were able to force quicker turnovers after losing possession. 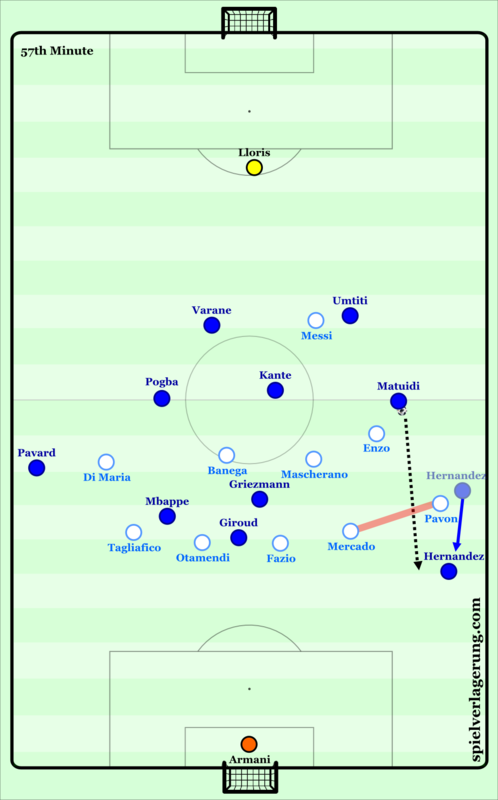 After Argentina fortunately took the lead, the roles in the game had reversed, France’s positional attacks became the dominant phase of the game with the South American side settling for quick attacks. France’s attacks became increasingly balanced, as they attempted to create through either wing. With more French left sided attacks than in the first half, Hernandez was found in far more offensive positions, which was necessary without a winger ahead of him. Both Pavard and Hernandez remained high and wide, with Argentina’s man-oriented wingers following resulting in temporary 5-4-1/6-3-1 structures. 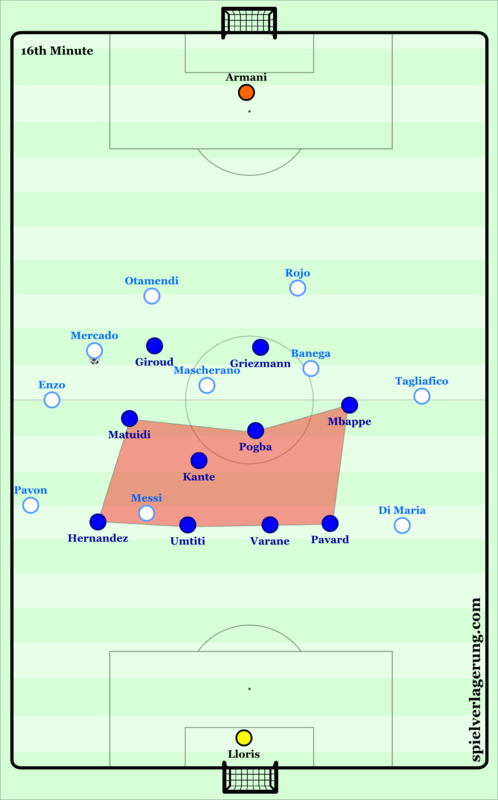 Without the support of the wingers, Argentina’s midfield line struggled to control the width of the half spaces, and France were able to use these spaces to set up attacks. Pavon, Argentina’s right winger, had a few orientation issues in response to Hernandez’ increasingly offensive positioning. With Matuidi dropping deep in the half space, Pavon was caught between staying higher to pressure him, or continue tracking the runs of Hernandez. In the move leading up to Pavard’s equaliser, Pavon widened his position too early to track Hernandez, opening a large channel between him and Mercado. He also failed to respond quickly enough to the diagonal run from his direct opponent and was thus caught in a bad body position. A combination of the ease France found in circulating in front of Argentina’s midfield, and Pavon’s orientation issues was implicit in Pavard’s equaliser and Mbappe’s first goal. Soon after France regained the lead, Sampaoli brought on Aguero for Enzo and moved to a 4-2-2-2/4-2-2-Messi-1 given the number 10’s licence to roam. Aguero played mainly in the left half space, with the wingers staying in high and wide positions. The double pivot, Banega and Mascherano were often very deep, giving short options for the defenders, whilst the full-backs often made diagonal underlapping movements. France’s fourth and final goal was the team goal of the tournament thus far. The European outfit created a build-up diamond with Lloris, the centre backs on the sides and Kante on the top of the box with the rest of the team remaining high. Due to France’s positioning and Argentina’s man-oriented nature, there was a large disconnect between Aguero and Messi and the midfield line. 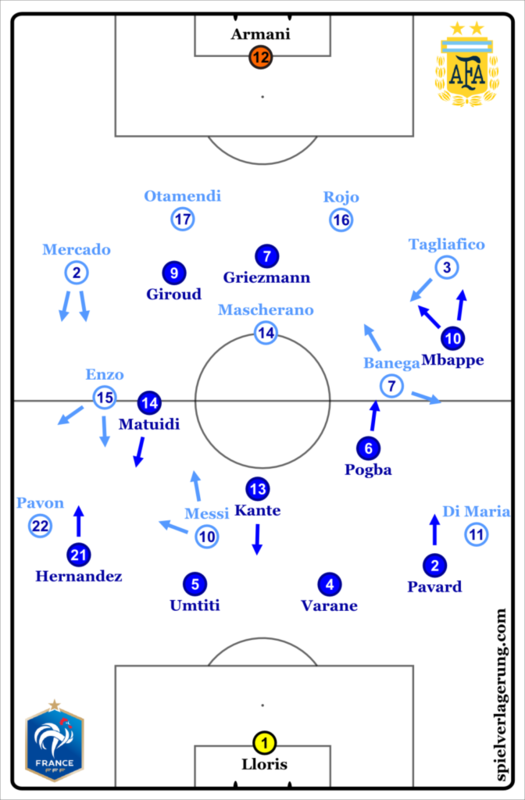 The effects of the switch to 4-2-2-2 were felt with Mascherano and Banega marking Pogba and Matuidi tightly, and no additional midfielder to mark Kante. France played out from the 4v2 with ease, with neither Messi nor Aguero prioritising the centre adequately, Messi blocking the pass to Umtiti whilst Aguero was anticipating the switch to Varane. Kante was thus able to receive in space and play directly through the midfield line to Griezmann’s feet as Banega followed Matuidi’s wide movement and Mascherano failed to shift. The pass to Griezmann drew Otamendi out of position, creating a large channel between Tagliagico and Fazio. It also drew Banega’s attention, leaving Matuidi free to receive the lay-off. Giroud then moved into this open channel, receiving the ball and maintaining an awareness of Mbappe’s diagonal run and Tagliafico’s attempts to close the channel, before playing a well-weighted through ball for the youngster to finish. Despite the close scoreline, France consistently appeared to be in control of the game in and out of possession. Their defensive shape was hardly tested due to Argentina’s inefficient positioning, and they showed an ability to threaten both through counters and in positional attacks against Argentina’s deep defence with highly offensive use of their full-backs. This ability to break through deep defences will be tested more thoroughly as they battle with Uruguay for a place in the semi-finals. I’m constantly amazed by how Argentine coaches manage to put the most awkward of structures on the field time and time again. Even Sampaoli! I’d imagined a tactical free thinker, a positive madman like him would be able to coerce some kind of structurally sensible football out of the albiceleste players. And they have Banega and Mascherano in midfield! You would think that those guys can play proper possession football blindfolded, but there you go. Also, there has been much talk – among others on this website – about how to implement Messi in the most effective way. I think that was Argentina’s main problem… they overfocused on Messi. And while it certainly is a reasonable endeavour to try to use Messi’s capabilities to their full potential – because then he’s not only the best in the world, but he’s so far above second best you have to wonder whether they’re even playing the same sport – it really impeded Argentina’s efforts: The first games’ channel-everything-through-Messi-approach was easy to defend, even for weaker opponents. Against France, they did the right thing in principle and tried to build up and attack in a way not entirely reliant on Messi, i. e. tried to create for and with him instead of having him create everything by himself. Which was the way to go, only their tactical execution of this strategy was, as pointedly explained in this article, ridiculous: In the first half they fielded the u-shapiest of u-shapes, in the second half they rendered their better approach useless when Sampaoli sacrificed the three-man-midfield to introduce Agüero as a striker. Beats me how he thought that might be a good idea. I think Argentina might really have been better off hadn’t they focused on Messi more than on any other starting player. He can play anything – I suppose he’d even be sort of good as a centre back, terrifying opposing defenders with pinpoint 60-yard-passes – and I suppose for the Argentinian national team, Messi in a tactical role that only lets him show 60% ob his ability within an otherwise functional tactical environment would still be many times more useful than Messi in a tactical role which in theory should bring out his full potential, but doesn’t because he gets no passes and supporting runs and everybody else ist apparently just confused by how to play a football. What I mean to say is: Had Sampaoli introduced a standard, reasonably well functioning run-of-the-mill 4-3-3 or 4-diamond-2 or anything else, really, Argentina should have been a considerable threat even without Messi, with the likes of Banega, Dybala, di María, Agüero… (sadly, the same does not apply to the defensive side of their squad. Otherwise they would be very much like France at the moment.) Instead what they got was a tactically entirely dysfunctional (in comparison to their individual potential) team, which Messi can and will still rescue outdribbling and outpassing five people, but not reliably enough or often enough to win a big tournament against top-class opponents. Sad! Argentina losing this game does not strike me as particularly weird. Anything else would have been extremely surprising. I don’t think they “have” to be somewhere on the top because of their amazing players. There are lots of amazing players in lots of teams and only those that are really fuelled with “wow wow wow” (France and Brazil) have been rather convincing whereas for instance Germany, Spain… Belgium needing a last minute goal against Japan, Italy with Verratti, Buffon, Insigne… not even qualified… I don’t think that just because you have players like Aguero and Dybala you should normally just go through. There are many, many pieces that just have to fall into place to make it through – and with Argentina there are so many things wrong or at least difficult. In my opinion any early decision of Sampaoli for a system and players would have been helpful. He tried to turn everything around, look for the perfect answer, for the perfect players… and then, oops, it’s world cup already. And then again he changed everything from game 1 to game 2. He only had one year and he tried just to much when a “simple” system and players knowing what they are supposed to do and with whom might have helped not to win the cup but to put on a more convincing show. Glad to read a perceptive comment after a very perceptive article.